President Donald Trump’s recognition of Jerusalem as Israel’s capital and intent to relocate the US embassy from Tel Aviv to Jerusalem is sure to harm the United States. A product of decades of pressure by Israel and its US lobby, the move is an incremental step toward pressuring the US to confer legitimacy on all of Israel’s territorial acquisitions accomplished through war. US presidents refrained from moving the embassy to Jerusalem because of commitments to UN Security Council Resolution 478, passed in 1980, which rejected Israel’s declaration that Jerusalem was its "complete and united capital" because East Jerusalem was territory captured in the 1967 Six-Day War, a war that Israel started. Parties to Resolution 478 committed to withdrawing diplomatic missions from the city. This created pressure on Israel to relinquish ill-gotten territory and negotiate peace. The US supported that goal since 1967 through the unanimous UN resolution 242, calling for the withdrawal of Israeli armed forces from territories captured in 1967. The original 1947 UN partition plan called for Jerusalem to be "internationalized." On November 22 IRmep filed a 40-page brief in the DC federal appeals court seeking an injunction against U.S. foreign aid transfers to Israel. The Appellant Reply Brief details the decades-old system of U.S. federal government prior restraint used to subvert Arms Export Control Act restrictions on foreign aid to non-NPT nuclear weapons states, in this case Israel. The Administrative Procedure Act is an appropriate avenue for challenging prior restraint. Proof that the U.S. government is violating, rather than possibly “secretly complying” with, the Arms Export Control Act. Direct injuries sustained by the plaintiff and other public accountability organizations. Why the Freedom of Information Act is insufficient to redress “nuclear ambiguity” injuries. Why a $238 billion injury inflicted on Americans warrants an extraordinary court-ordered remedy. The U.S. Department of Justice once again insisted that individual citizens do not have standing to sue the U.S. federal government over foreign aid to Israel. Several Americans from Fagan Dickson in 1975 to author Isaac Asimov in 1991 have tried. But their claims, based on Establishment Clause separation of church and state appeals, failed. The CIA wants the US District Court for the District of Columbia to dismiss an IRmep lawsuit filed in 2015 that seeks disclosure of top-line budget numbers for secret U.S. intelligence aid to Israel. In a 29-page filing submitted on November 3, the agency argued that even acknowledging such aid exists would be "hindering the national security of the United States." IRmep estimates that secret U.S. aid funneled through the CIA could be as high as $1.9 billion to $13.2 billion per year. This estimate is derived from President Obama's 2015 statement that American military and intelligence assistance had reached "unprecedented levels." Since U.S. military and other aid since 1948 is publicly known, secret intelligence aid would have to be at least $1.9 billion for it to truly be "unprecedented." The CIA argues that Obama's statement does not meet the threshold of "official acknowledgement that the CIA has intelligence budget line items supporting Israel." CIA further claims that it "specializes in human source intelligence," and if it acknowledged the existence of a budget, it would tip off enemies about its clandestine activities. The CIA claims that, because of this, it can issue a GLOMAR response (not confirming or denying such information exists) because it could be held by any one of 17 U.S. intelligence agencies. IRmep has previously communicated to the court that all but two U.S. intelligence agencies deny having budget line-items for support to Israel. IRmep has also repeatedly made the case that classification or retention of such information to facilitate violating the law is explicitly forbidden under Executive Order 13526. 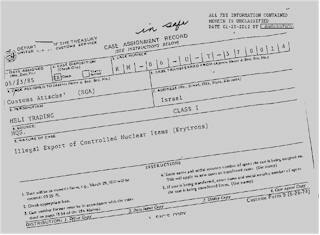 In this case U.S. foreign aid to Israel, a state with a nuclear weapons program that has not signed the Nuclear Non-Proliferation Treaty, is subject to restrictions under the Arms Export Control Act. IRmep's opposition brief is due on December 1. 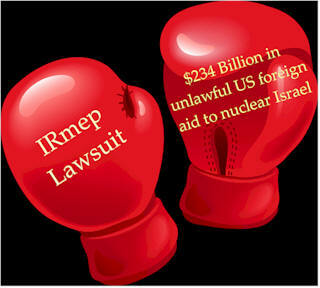 In 2016 IRmep filed a lawsuit in federal court challenging U.S. foreign aid to Israel and a 2012 federal gag order on the release of information about Israel's nuclear weapons program. News of the lawsuit generated headlines around the world. Now in the U.S. Court of Appeals for the District of Columbia, courtroom action is again heating up as the Department of Justice prepares to file its long-delayed appellee brief on November 8. Join IRmep Director of Research Grant F. Smith for a lively presentation and Q&A session about this potentially ground-breaking lawsuit. 1. What are the overall goals of the lawsuit challenging the nuclear gag order and foreign aid? 2. What is WPN-136, "the Israel nuclear gag-order," and why is it important? 3. What are the Symington and Glenn amendments to the US Arms Export Control Act? How do they impact aid to clandestine nuclear weapons countries? 4. Have any parties ever sued to stop U.S. foreign aid to Israel? If so, what happened to their cases? 5. What happened to IRmep's attempt to enjoin U.S. foreign aid to Israel in the Lower Court? What is happening in the Court of Appeals? 6. What gives IRmep standing to sue on such matters? 7. What other related lawsuits has IRmep filed, on secret CIA aid to Israel, U.S. Treasury Department activities, and the diversion of US weapons grade uranium to Israel, and how are they doing? 8. What tactics do defendants commonly deploy in responding? How much leniency do they commonly obtain from judges? All conference call registrants will receive an access code, email reminders, a numbered soft copy of materials presented online, and the opportunity to submit questions. This conference call will be recorded. Just before the annual American Israel Public Affairs Committee (AIPAC) policy conference and mass congressional lobbying day in Washington, DC, the “Israel Lobby and American Policy 2018” conference will be held on Friday, March 2, 2018 at the National Press Club. 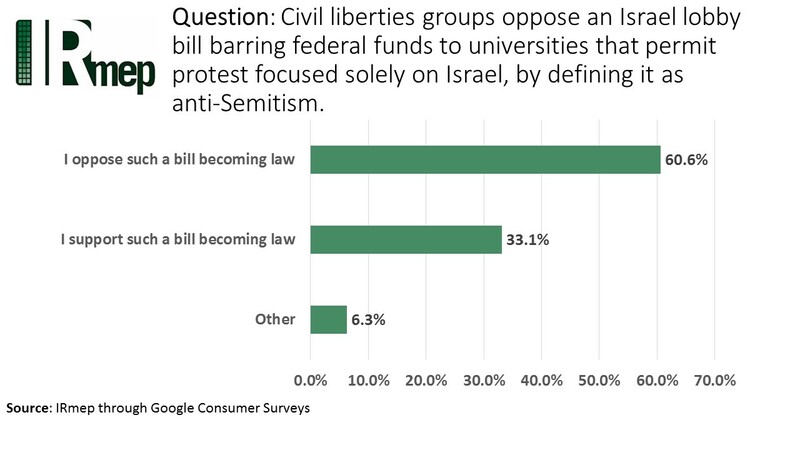 What is the current estimated cost and trajectory of major Israel lobby initiatives such as the Israel Anti-Boycott Act law that seek to fine and jail American organizations and individuals engaged in boycotts of Israel over systematic human rights abuses? What impact could other major Israel lobby initiatives—including precipitating U.S. attacks on Iran, renewed U.S. attacks on Syria, moving the U.S. embassy to Jerusalem, and formal U.S. recognition of Israel’s annexation of East Jerusalem, Golan Heights and West Bank—have on America’s global standing? How is American public opinion shifting on key issues such as unconditional military aid to Israel, the influence of Israel on U.S. policymakers, and trust in coverage of Israel by the mainstream news media? What is the current level of Israel lobby “capture” of major U.S. institutions, especially government agencies, think tanks, academia and news outlets? What is Israel’s long-term regional strategy and how does it attempt to engage the U.S. in achieving its objectives through the Israel lobby? How are peace and human rights activists pushing back against the lobby in courtrooms and at the grassroots level? What new roles are artists taking on to challenge Israel lobby initiatives? What is the pushback? How do Israel lobby “gatekeepers” influence campus debate, academic appointments and curriculum? What are the current challenges to liberal Zionist beliefs, public perception of Israel as being interested in peace, and the notion of universal American Jewish support for Israel? Which country has a quantitatively larger influence on U.S. electoral politics, Russia or Israel? Will Israel likely break its agreement not to seek more than $38 billion in U.S. military aid over the next decade? What amount of secret intelligence aid is Israel also receiving, and why are U.S. intelligence agencies fighting to keep it secret? 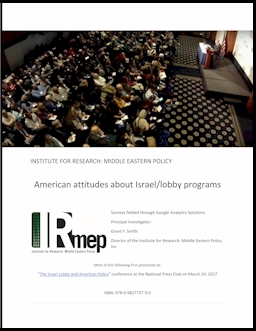 The Israel Lobby and American Policy conference is solely sponsored by the American Educational Trust, publisher of the Washington Report on Middle East Affairs, and the Institute for Research: Middle Eastern Policy (IRmep). Attendees receive a box lunch. Go to the conference website for more information, mail-in registration forms, and student tickets today! Or go directly to Eventbrite for online ticket purchases and donation opportunities! Israel has begun taking possession of allotments of F-35 stealth jets from the US. 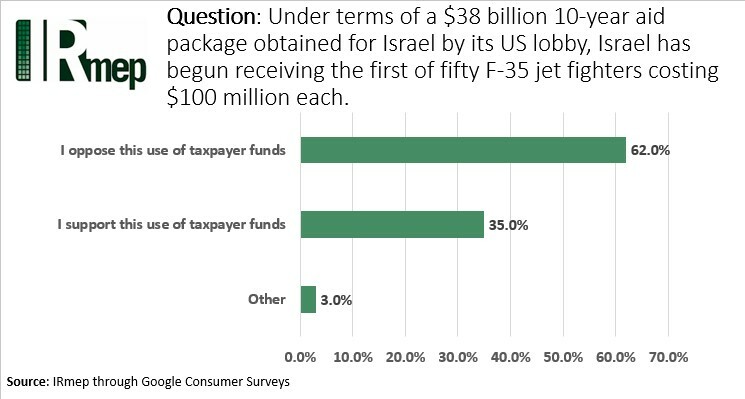 Although many reports describe the transfer as an Israeli "purchase" of the aircraft, under an unpopular ten-year $38 billion aid deal, Israel will receive fifty of the jets at no cost. Results from a public opinion poll of 1,000 American adults fielded through Google Surveys reveal widespread popular opposition to the transfer. 62% of Americans are opposed providing the jet fighters to Israel, while 35% support the transfer and 3% have other responses. The survey was fielded between August 29 and September 4 and has an RMSE score of 7.4%. Individual response data is available from Google. WASHINGTON (CN) — A federal judge rejected the CIA’s request to reconsider a court order that it respond to a Freedom of Information Act request on the dollar amount of U.S. intelligence support for Israel. U.S. District Judge Tanya Chutkan in March ordered the CIA to process a March 2015 FOIA request from Grant Smith, director of the Institute for Research: Middle Eastern Policy. ...Smith said he will challenge the CIA if it admits it has the information but refuses to release it under a FOIA exemption. 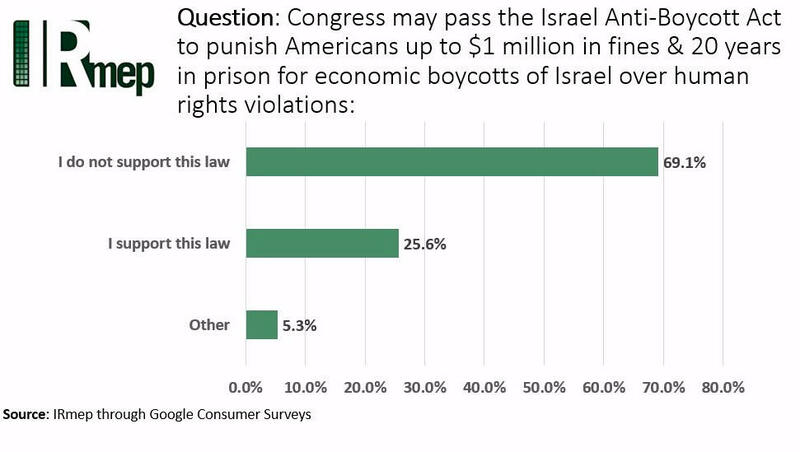 Congress may pass the Israel Anti-Boycott Act to punish Americans up to $1 million in fines & 20 years in prison for economic boycotts of Israel over human rights violations. ...Beyond subverting the First Amendment, which it is clearly intended to do, the Israel Anti-Boycott Law inserts Israel into Chapter 56 – Export Administration section 4607, making Israel the only specifically designated foreign country in a trade law designed to advance US – not foreign – commercial interests. IABA suddenly makes US policing of foreign countries possibly interested in BDS, blocs such as the European Union and the UN, a US national security interest and problem – which they are clearly not – by placing Israel at the center of the US Export Administration Act of 1979. IABL amendments seek to ban organizations like the UN from compiling and distributing lists of companies doing business in territories illegally occupied by Israel. What US national interest is served by banning transparency over illegal Israeli activity? No interest. Finally, the bill’s "rule of construction" mandates "nothing in this section shall be construed to alter the established policy of the United States or to establish new United States policy concerning final status issues associated with the Arab-Israeli conflict, including border delineation, that can only be resolved through direct negotiations between the parties." Translated into English, this means that Israel and its lobby can continue to use the US as a diplomatic lever, but Palestinians cannot employ UN, the EU or other allies in the international community, as a comparable counterweight. There are many reasons why Israel might want the US to rewrite laws designed to advance America, to protect Israel against economic backlash. Few Americans are served by such meddling. So why do members of congress such as Ben Cardin quietly foist such laws on their constituents (and fellow Americans), to the extent of threatening fines and prison time? 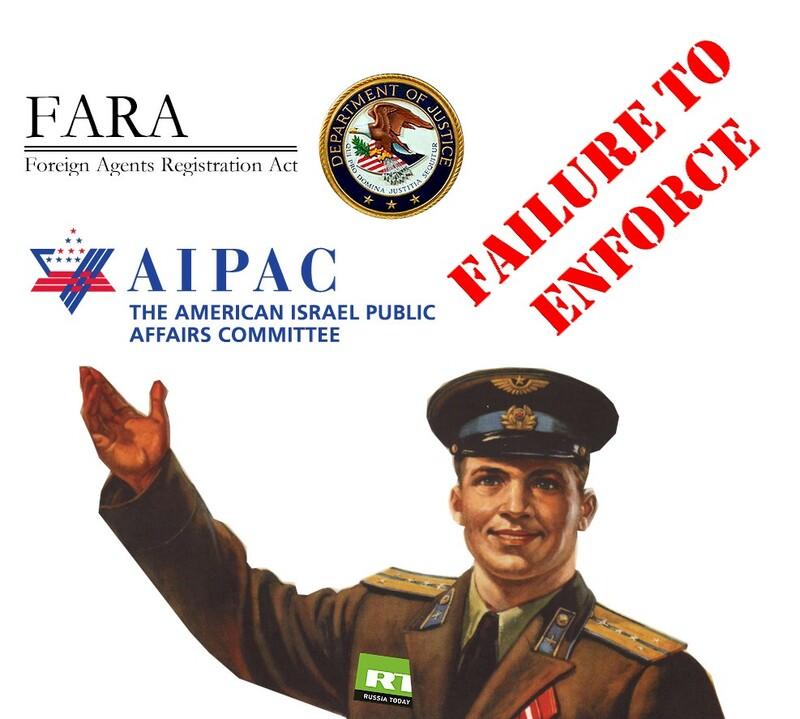 "AIPAC's "Israel Anti-Boycott Act" A Threat To All Americans 7/26/2017 - "Takes on the World"
Host Jeffrey Blankfort and guest Grant F. Smith discuss the Israel lobby, foreign agents hearings, and the new "Israel Anti-Boycott Law," and much, much more! Radio program podcast page and show notes. 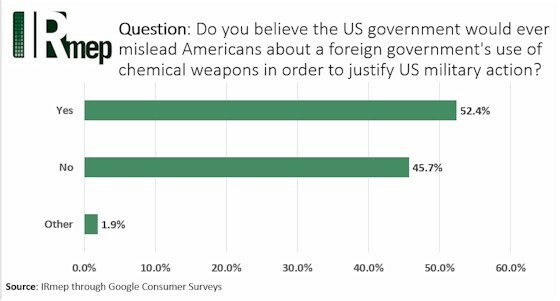 The IRmep poll administered by Google Surveys has a RMSE score of 5.8 and was fielded July 5-22, just after Seymour Hersh’s stunning investigative report discrediting the official narrative justifying President Trump’s authorization to launch fifty-nine Tomahawk missiles at the Shayrat Air base in Syria on April 6. ...The effort to register Israel’s foreign agents clearly failed. Just 42 days after the Justice Department order, the American Israel Public Affairs Committee incorporated itself in Washington and took over the AZC’s functions. Since the year it was ordered to register—as part of the AZC—AIPAC has extracted an inflation-adjusted $250 billion from US taxpayers for its foreign principals. Influencing the conduct of US policy "by techniques outside normal diplomatic channels" has never stopped. A majority of American adults – 70.3 percent – do not consider themselves Zionists when defined as "A Zionist is a person who believes in the development and protection of a Jewish nation in what is now Israel." Only 24.9 percent say, "I consider myself a Zionist" while 4.8% provided other responses. 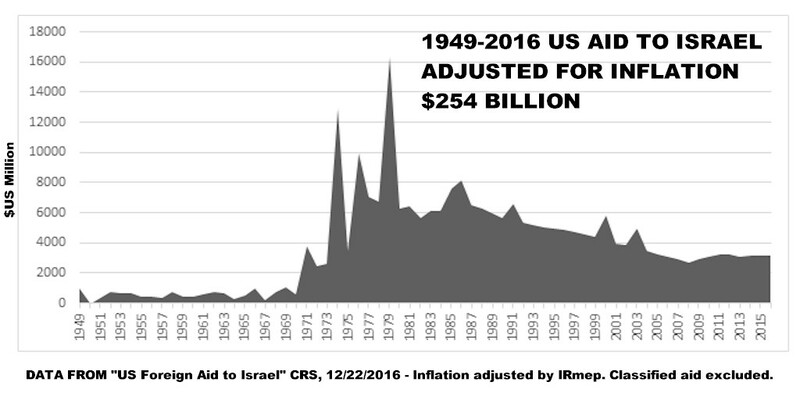 The United States has given Israel more foreign assistance than any other country. 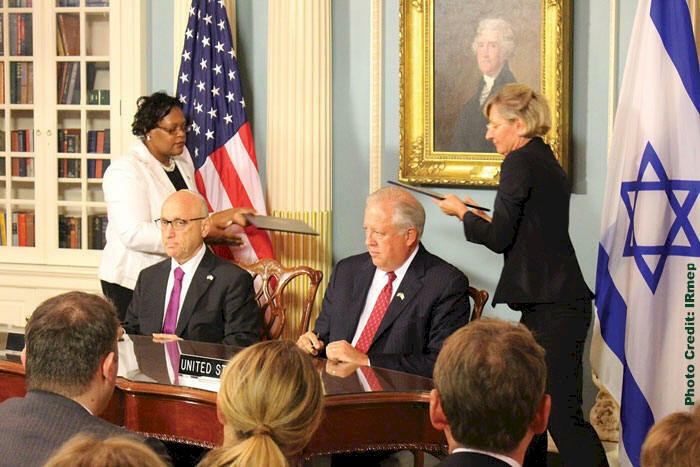 In recent decades, a guaranteed aid minimum has been formalized through ten-year "memorandum of understanding" agreements signed by the US Department of State and the government of Israel. In the world of business, MOUs are not legally binding and are frequently just stepping stones to binding legal contracts for initiatives such as joint ventures or partnerships. In US law, MOUs are the same as non-binding "letters of intent." MOUs are used in international relations because they take less time to enact, do not involve ratification by the US Congress and can even be kept secret from taxpayers. See the Israel Lobby Archive for more! Summary: Grant Smith of IRmep, a keen observer of AIPAC and the institutions of the Israel Lobby, notes how the presence of right-wing pro-Israel, pro-settlers in Trump's White House and family, makes the historic role of AIPAC and the Conference of Major American Jewish Organizations redundant and accounts for the failure of Trump to observe the tradition of past US presidents in consulting with them before he has meetings with an Israeli prime minister or travels to Israel or the Middle East. He points out that polls he has fielded show Americans to be ahead of their politicians, citing as an example, a poll that showed that the majority of Americans supported the Obama administration's decision not to veto the UNSC resolution criticizing Israeli settlements and that 28% of the public think Israel is liable to get the US into a major war, only exceeded by South Korea among US allies. ...American fears over Israel may be based on longer term developments. In April, Israel conducted strikes on Syrian targets that it claims were aimed at disrupting weapons transfers from Iran to Hezbollah. Israel’s years of threats to attack Iran’s nuclear facilities were only quelled by likely joint US-Israeli cyber-attacks that destroyed Iranian centrifuges and adoption of the 2015 Joint Comprehensive Plan of Action. The JCPOA verifies the Iranian nuclear program is not used to produce nuclear weapons. Israel’s leadership understands well why defeating Assad is now in its interests…. Defense Minister Ehud Barak argued that "the toppling down of Assad will be a major blow to the radical axis, major blow to Iran…." Bringing down Assad would not only be a massive boon to Israel’s security, it would also ease Israel’s understandable fear of losing its nuclear monopoly. Then, Israel and the United States might be able to develop a common view of when the Iranian program is so dangerous that military action could be warranted. On May 3, 2017 the Department of Homeland Security released the most detailed files to date on the 1979-1983 Richard Kelly Smyth/Arnon Milchan/Benjamin Netanyahu krytron smuggling ring. The 100-page dossier (PDF) answers important questions about how highly sensitive US nuclear weapons technologies were smuggled out of the country in the early 1980s. The pages leave two key questions unanswered. The first is why Arnon Milchan was not indicted alongside his co-conspirator Richard Kelly Smyth. The second is why in 2016 Secretary of State John Kerry granted Milchan a long-term visa to reside in the United States even after career Department of State officials initially refused. The files, originally scheduled to be declassified in the year 2037, reveal that on December 6, 1979 the Israeli Ministry of Defense suddenly developed a need "of the utmost importance" for sophisticated devices invented and manufactured by EG&G called "krytrons." Krytrons required a munitions license for exportation since they can be used to initiate the precisely timed conventional detonations necessary to create the "symmetric implosion shockwave needed for nuclear weapons." Israel, which had just successfully conducted a joint nuclear test with apartheid South Africa, may have needed the devices for hydrodynamic testing and building up to 200 nuclear weapons for its own use, as well as agreed-to sales to South Africa. Detonating circuits for a single nuclear device can use two, four, or more, krytrons. By 1987, it became known to the US Department of Defense that Israel also had a hydrogen bomb project underway which may have necessitated reliable triggering mechanisms. Washington, DC – On May 8, 2017 IRmep Director Grant F. Smith filed an emergency motion asking the US Court of Appeals for an injunction on the immanent transfer of US foreign military assistance to Israel. Appellants argue that Israel’s nuclear weapons program requires either that the aid be withheld, or that long-neglected special procedures under the Arms Export Control Act be followed. The Trump administration has not issued required special waivers, as has been done for Pakistan and other nuclear weapons countries, that would make the aid legal under the Symington & Glenn Amendments. On March 30 Federal Judge Tanya Chutkan found it "neither logical nor plausible" for the CIA to claim it had no intelligence budget expenditure data of support to Israel between the years 1990 and 2015. The court then ordered the Department of Justice legal counsel to "meet and confer" about responding to the original Freedom of Information Act request for the data and file a response by April 24. The original FOIA request sought public disclosure of the secret portion of US taxpayer-funded foreign assistance delivered to Israel. (PDF) Although "memorandum of understanding" packages, the most recent guaranteeing $3.8 billion per year over a decade, and additional Israel-bound appropriations passed by Congress are publicly known, secret US intelligence aid is not. On September 11, 2013 journalist Glenn Greenwald revealed that the National Security Agency was pumping electronic intercepts of communications of American citizens to Israel, with no legally binding limits on how the data could be used. WASHINGTON (CN) – A federal judge called it “neither logical nor plausible” Thursday that the CIA has no information about intelligence budget-line items earmarked for Israel between 1990 and 2015. The March 30 ruling came in response to a Freedom of Information Act request from the director of the Institute for Research: Middle Eastern Policy who asked for the information back in March 2015. 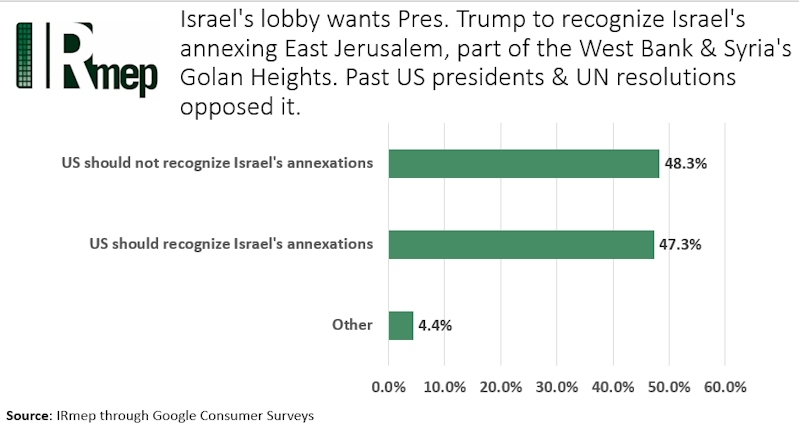 Solid majorities of Americans do not approve of major Israel/lobby programs, how they are won, and the vast amount of unconditional US diplomatic commitments and funding they consume. However, only by transforming into active opposition, rather than passive opposition, will Americans be able to get their government into the business of representing them, rather than the small—but unquestionably influential—Israel/lobby. For news media and analysts to be taken seriously, they must begin to discuss the Israel/lobby as the primary force behind outcomes most Americans—quantifiably—oppose. 8:00-9:00 AM Registration and “Two Blue Lines”: A documentary film screening in the Ballroom. Exhibition hall opens in adjacent Holeman Lounge. 9:10 AM Grant Smith: The series of stunning—but underreported—polls revealing true American attitudes about U.S. aid to Israel and other top American Israel Public Affairs Committee (AIPAC) programs. 9:40 AM Keynote—Professor John Mearsheimer: What has changed in the decade since his book The Israel Lobby and U.S. Foreign Policy was published. Subsequent findings, foreign policy choices the U.S. makes that it otherwise would not—if not for Israel—and what the new administration could do differently in the future that would better serve broader American interests. 10:30 AM Professor Maria Lahood: Recent legislation that threatens the First Amendment rights of Palestinian solidarity activists in the U.S. and the legal challenges thereto. 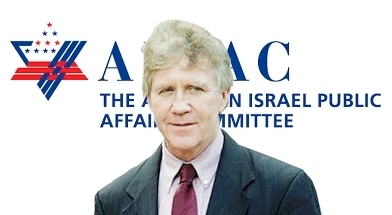 11:15 AM Former Congressman Jim Moran (D-VA): What it takes to beat the Israel lobby in Congress. 11:40 AM Former Congressman Nick Rahall (D-WV): How to support the members of Congress who are beginning to listen to their constituents on Middle East policy issues. 12:15 PM Lunch Break & Screening of selections from the four-part Al Jazeera six-month undercover investigative series “The Lobby.” Jack Shaheen and John Mearsheimer book signings. 1:00 PM Keynote—Hanan Ashrawi: The Israel lobby and the “peace process" from a Palestinian perspective. 2:10 PM Jack Shaheen: Strategies to successfully push back against harmful Hollywood stereotypes about Arabs and Muslims, and the work new generations must now take on. 2:40 PM Wajahat Ali: The intersection of pro-Israel organizations & donors and Islamophobia uncovered as the lead author and researcher of the report "Fear, Inc: The Roots of the Islamophobia Network in America." 4:15 PM Keynote—Professor Ilan Pappé: The value of viewing Israel-Palestine through the lens of settler-colonialism, how Zionist myths have been shaped and/or perpetuated by the Israel lobby, and what framework is necessary to overcome these myths and ensure that efforts to resolve the "conflict" are grounded in reality. 5:00 PM Clayton Swisher: The director of investigative journalism for Al Jazeera Media Network screens and comments on selections from “The Lobby," the four-part series about the Israeli Embassy’s covert influence campaign in Britain. This undercover investigation reveals how the Israeli Embassy sought to establish supposedly "independent” pro-Israel groups in England, AIPAC's efforts to establish itself in London, unfounded accusations of anti-Semitism lodged against Labour Party members, and discussions by disgraced former Israeli diplomat Shai Masot to "take down" UK lawmakers deemed hostile to Israel. 5:30-7:30 PM Networking Reception & Book Signings: Wajahat Ali, Hanan Ashrawi, Ilan Pappé and Clayton Swisher. 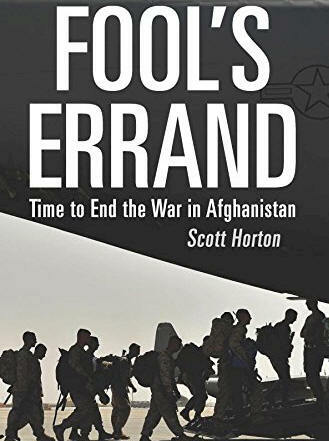 ...The process by which Israel obtains aid – through the activities of a vast domestic lobby it helped establish – reveals why the funds it extracts from taxpayers should not be compared to equally troubling military alliance expenditures. A $3.7 billion, 14,000 employee, 353,000 volunteer Israel affinity nonprofit ecosystem has been built in the United States to provide Israel with the support that following America’s own interests would not. The approaching annual spectacle of thousands of AIPAC lobbyists subtly threatening to withhold vast amounts of campaign contributions from members of Congress if they don’t provide billions in unconditional taxpayer-funded aid – portrays an entirely accurate picture about the means through which it is obtained. 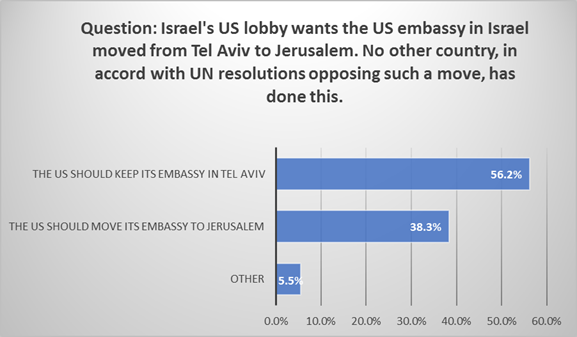 An IRmep poll fielded by Google Consumer Surveys January 27-29 reveals 56.2 percent of the US adult Internet user population prefers the US keep its Israel embassy in Tel Aviv. Only 38.3 percent prefer moving it to Jerusalem, while 5.5 percent are either uncertain or have other responses. The statistically-significant survey has an RMSE score of 3.3%. On January 18 IRmep urged Federal Judge Tanya Chutkan to block unlawful US foreign aid disbursements to Israel. We also further exposed and refuted the Justice Department's legal campaign to protect an unlawful legislative rule that attempts to punish all who speak or write about Israel's clandestine nuclear weapons program. Former Defense Department analyst Lawrence A. Franklin was convicted of felonies for passing in 2004 classified military information to two American Israel Public Affairs Committee (AIPAC) lobbyists and an Israeli diplomat. Franklin worked for Under Secretary of Defense Douglas Feith, a major proponent of the disastrous US Iraq invasion. The AIPAC officials tried to use Franklin’s information to get the US to militarily “pivot” toward Iran by getting coverage that Iran was attacking the US in the Washington Post. The two AIPAC officials—Steve Rosen and Keith Weissman—were charged but avoided conviction. Shortly after Obama took office, the Department of Justice abruptly dropped a very solid criminal case developed by the FBI. Israel affinity organizations and their leaders generally lobby hard to get non-prosecution (urging “prosecutorial discretion”) for cases of major U.S. crimes that benefitted Israel. When that fails, coordinated efforts are made to overturn felony convictions. On October 18, 1961 JFK pardoned “Hank” Greenspun’s felony conviction for smuggling arms during Israel’s War of Independence after intense lobbying. On January 20, 2001 Bill Clinton pardoned “Al” Schwimmer, founder of Israel Aircraft Industries, for similar crimes. On January 1, 2009 George W. Bush issued a posthumous pardon for B-17 bomber smuggler Charles T. Winters after intense lobbying by more than 28 members of congress, the American Jewish Committee, and Jewish federations. Many of them argued that crimes committed for Israel should not be punished and that many others had done much more and not been punished. In December, the US Pardon Attorney took a hard line and refused to release any correspondence under the Freedom of Information Act for a handful of convicts who recently attempted to engage in similar activities. After an appeal, the Pardon Attorney did disclose that only Lawrence Franklin (PDF) currently has an open petition seeking a pardon from President Obama before he leaves office. Others petitioning in support of his pardon have not gone public—as was the case of Jonathan Pollard—and will likely remain unknown absent a speedy FOIA remand from the Department of Justice Office of Information Policy.